We’re proud to announce another milestone in the evolution of eSarcasm, The Web Site That Builds Strong Bodies 12 Ways ™. Today marks the official entry of eSarcasm into the burgeoning world of eCommerce with the launch of The eSarcasm eStore. Soon our thousands hundreds dozen three fans can own all manner of eSarc regalia, from wittily-captioned T-shirts to coffee mugs, refrigerator magnets, and yes, underwear. 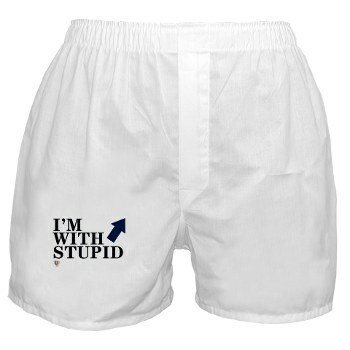 Wear one of these babies on a first date and you’re almost certain to score (though you may be alone when it happens). HELP WANTED: eSarcasm is actively seeking an attractive female between ages of 18 and not dead to model our wares for publication on our site. Applicants should send an email noting their qualifications, a hot picture, and a signed affadavit affirming the picture really is of you to models@esarcasm.com. OK, we’ll settle for the hot photo. But we are serious about the modeling bit. eSarcasm LLC is pleased to announce it has just closed a round of Series Q funding from venture capital firm Voldemort Vader & Associates. “With this money we’ll be able to do a lot of things we’ve been wanting to do for a long time, like buy new pencils and restock the Mr. Pibb machine,” noted site co-founder and chief snark wrangler JR Raphael. Along with the initial angel funding from Mazzaroni Construction & Cremetoria, The additional funds bring the total capitalization of the company up to nearly $900.